Here is a great new tv interview of Joan Van Ark (looking gorgeous) where she speak about her 40years marriage. A very emotional tv moment. . .
Let's get serious, with a new design this blog diserved a new wallpaper, here it is with some new pics of Joan on the red carpet (she is slightly photoshopped...!). Yes, Joan is glam and I'm tired of seeing unfair pictures of her on google...! Here is a caricature I did of Joan, I love doing this type of funny drawing, I was inspired by pics of the 80's, hope you like it. . . Also look at my main blog adress on the drawing. .I'm glad to see that there is a lot of visit on my blog worlwide! 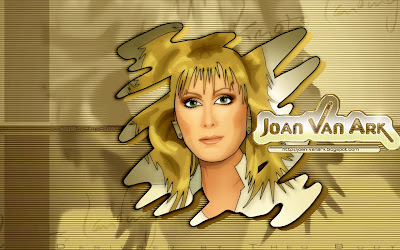 Here is a special and unique illustration I made of Joan Van Ark, and turned it into a wallpaper. It's inspired from a beautiful picture that was on the cover of a french magazine in the early 90's. Today I was glad to find back my Knots Landing' (Côte Ouest) video tape... And watch few episodes where Val hesitate to divorce from Gary and then decide to become a star writer in New-York! That was very nice! I invite you to discover my brand new website here > www.theobody.com Enter my graphic universe... . . .
. . . CÔTE OUEST / KNOTS LANDING . Fan-Blog 2007 . . .